STEVENSON is pleased to present a solo exhibition by Sabelo Mlangeni. 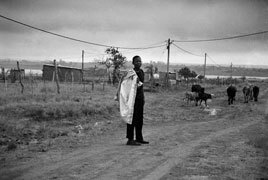 Ghost Towns brings together two bodies of work: Mlangeni's recent photographs of small towns and his At Home series which will be shown in Cape Town for the first time. At Home focuses on rural areas where breadwinners have migrated away in search of work, leaving behind the young and the old. For those 'left behind at home', life is slow and seemingly empty; the landscape assumes unreal contours, and light and dust make everything look as if suspended in time. These places, where many urban immigrants have their roots, are portrayed as spaces of waiting, seen through the filter of memory. The villages possess a distinct tranquility and spaciousness even though there is poor sanitation, teenage pregnancy, lack of basic information and an increasing number of orphans. Quietness; emptiness; grass on a pedestrian pavement, cracked roads, closed-down shops; these images suggest both fiction and non-fiction, past and present scars left unattended. The suggestion of death. 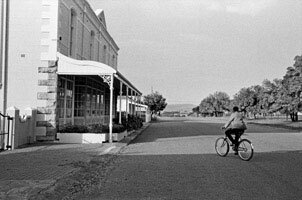 Forgotten towns with a rich history that has been lost in the fast-moving pace of a South African landscape. 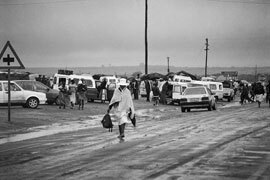 Most of the people have left and migrated to bigger towns and cities; attracted by economic opportunities, only returning for funerals of their loved ones. 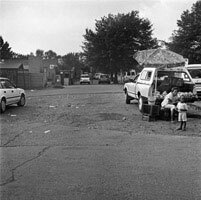 The photographs document [these] small towns today, the shift that has taken place, and where freedom and opportunity have somehow skipped past these towns. Mlangeni was born in 1980 in Driefontein near Wakkerstroom in Mpumalanga. 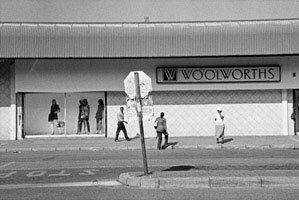 In 2001 he moved to Johannesburg where he joined the Market Photo Workshop, graduating in 2004. He won the Tollman Award for the Visual Arts in 2009. 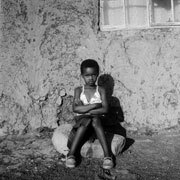 His first solo show, Invisible Women, took place at Warren Siebrits, Johannesburg (2007). His Men Only and Country Girls series showed at Michael Stevenson, Cape Town, in 2009 and 2010 respectively. 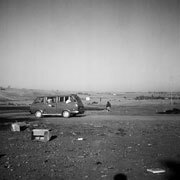 Recent group exhibitions include Figures and Fictions: Contemporary South African photography at the V&A Museum, London (2011); Possible Cities: Africa in photography and video, Cantor Fitzgerald Gallery, Haverford College, Pennsylvania (2011); Afropolis: City, Media, Art, Rautenstrauch-Joest-Museum, Cologne, Germany (2010); and I am not afraid: The Market Photo Workshop, Johannesburg, Johannesburg Art Gallery (2010). Mlangeni will exhibit concurrently with Berni Searle.